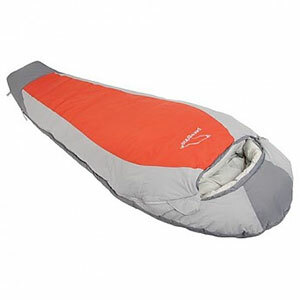 An inexpensive hybrid design sleeping bag that works great in warm weather. 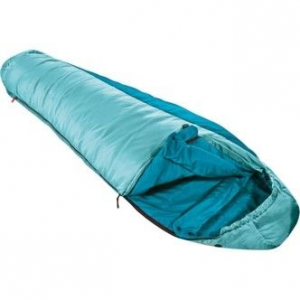 Would be a perfect lightweight option for emergency equipment in a vehicle as well as being a decent bag for summer backpacking. 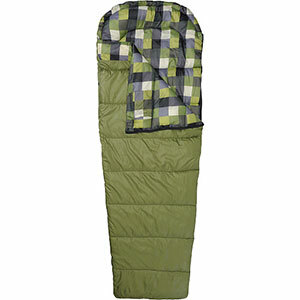 Being a budget backpacker, I realized that one major way I could cut weight off my base load was to find a lighter sleeping bag that would keep me comfortable. I am also a stomach sleeper (one leg bent), so a skinny bag (mummy) wasn't going to cut it for me. In reality, almost anything was going to be lighter than the 4.28 lb. 0-Degree bag I had been hauling around. Taking my scale with me to the store a day before a summer overnight trip, I weighed the Alpine Design 45-Degree Micro Lite Mesa Rec. Wow! It was a mere 38.4 oz., which for me, was a huge weight savings. At the very attractive price of $29.99, I figured it was at least worth a try. The bag felt a little thin to me, but maybe I'm just used to my heavier bag. I liked that it was a hybrid shape, meaning it was a cross between a standard rectangle shape and a mummy style. There is no hood, but it has sort of an extension of the bottom of the bag where your head goes instead. A zipper lock is included, and there is no draft flap. A nice feature is its internal stash pocket (cell phone size) that might come in handy for a watch or light. In use, I felt plenty warm, and even unzipped the bottom to let my feet breathe. To be honest, there is hardly any loft to this bag (comparable to a military poncho liner), but it kept me very comfortable. The left-side zipper worked as it should, with no snags. I particularly appreciated the pad straps, which successfully kept my pad underneath me for the entire night (a first for me), even through all my spinning. This bag also has sewn-in webbing straps, which made it very easy to roll up and get into a compression sack, but I suppose these could be cut off to save some weight. I have only used this bag once so far and it held together just fine, but for the price, I can throw it in the van or truck for emergency use if I don't like it for backpacking and it would be a zero-loss situation. Thanks for the review, Kathleen. I'd be interested in hearing if your opinion changes after a few more uses. The Alpine Design 45-degree Micro Lite Mesa Rec Bag is not available from the stores we monitor.